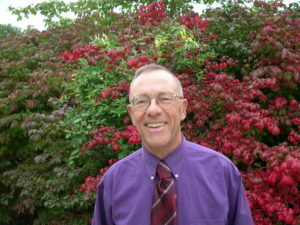 Dr. Douglas Futuyma is a Distinguished Professor in the Department of Ecology and Evolution at Stony Brook University. He also holds an appointment as a Research Associate at the American Museum of Natural History. Douglas received his B.S. in Conservation from Cornell University and his M.S. and Ph.D. in Zoology from the University of Michigan. After receiving his Ph.D., Douglas joined the faculty at Stony Brook University where he has worked for most of his career. He served on the faculty at the University of Michigan for a few years from 2002-2004 before returning to Stony Brook. Douglas has written one of the most popular textbooks on Evolution and has received numerous awards and honors over the course of his career. He is an elected Member of the National Academy of Sciences, as well as a Fellow of the American Association for the Advancement of Science and the American Academy of Arts and Sciences. He was also awarded the SUNY Chancellor’s Award for Excellence in Teaching, a Guggenheim Fellowship, a Fulbright Senior Scholarship, the Sewall Wright Award from the American Society of Naturalists, the Joseph Leidy Award from the Academy of Natural Sciences of Drexel University, and an Honorary Doctoral Degree from the National University of Mongolia. In our interview Douglas shared stories from his own life and science. Douglas is a passionate naturalist who loves being outdoors and expanding his knowledge of natural history. He has also been an avid birdwatcher for the past 25 years. Each weekend, Douglas joins other members of the local birding community to observe birds in their area. In addition, Douglas is an opera and classical music enthusiast. Throughout his career, Douglas has been fascinated by evolution and how species adapt to their environments. Much of his research has examined the ways in which insects that eat plants have evolved (or failed to evolve) in their ability to eat different kinds of plants. Beyond his specific research area of expertise, Douglas has taught courses on evolution and evolutionary ecology, as well as served as a general spokesperson for evolution. The vast diversity of animals on our planet has enchanted Douglas since his childhood. He used to take the subway to the Bronx Zoo, which was one of the largest zoos in the country at the time. By middle school, Douglas was frequently out exploring nearby parks in New York City to observe the many insects, frogs, salamanders, and birds there. Around the same time, Douglas received his first pair of binoculars as a gift from his father, and he began meeting some of the local birdwatchers in the area. Douglas’s fascination with animals persisted in college, and his courses shaped his understanding of biological science. He realized that he could best understand the diversity of animal and plant life by pursuing a career studying ecology and evolutionary biology. One of the fascinating, but frustratingly unanswered questions that Douglas has investigated involves a moth called the fall cankerworm moth. Within this species, Douglas discovered that there were instances where female moths and all of their offspring were genetically identical. However, there was also evidence that male and female moths were mating. To make matters more complicated, they noticed that it wasn’t uncommon for females to lay a batch of eggs where none of them would hatch. This was a challenging mystery to tackle because the months only emerge once a year in the fall, and they initially missed their window of opportunity to do many of the necessary experiments. As a result, they had to wait an entire year before they could further unravel what was happening. Douglas discovered that only the eggs of females exposed to males would hatch, but the offspring would still all have an exact match of the mother’s genome. It appeared as though the males were necessary, but their genetic information was not being incorporated into the embryo. Thinking about this mathematically, after a while, all of the males should go extinct if all of the offspring were exact copies of the mothers. However, this is not the case, and despite all the work they put into this project, Douglas still doesn’t know why. Douglas previously conducted research on a group of beetles in which the different beetle species each fed on specific plant species within the daisy family. His goal was to examine whether these beetles had the genetic potentiality to feed on other species within this family of plants. His lab created phylogenetic trees using DNA data to determine the relatedness of the individual beetle species and also the relatedness of the plants they ate. They discovered that beetle species that are more closely related feed on plants within the daisy family that are more closely related. This suggested that the beetles were evolving in relatively small steps, rather than big leaps. Douglas’s team next conducted genetic studies to examine whether these beetles had the genetic potential to adapt to eating a different species of plant. The results indicated that there was adequate genetic variation in some cases for a species to adapt to eating plants that were closely related to the plant species they currently consume. These findings were exciting because they matched the evolutionary history they saw in the phylogenetic trees. This was one of the first studies to match the evolutionary processes in individual species (microevolution) to the big picture of how species have evolved over millions of years (macroevolution). Two of Douglas’s favorite places he has visited are Costa Rica and Turkey. Douglas dreamed of visiting the tropics since he was a kid marveling at all the exotic animals in the Bronx Zoo. In the summer after his first year in graduate school, he finally had the opportunity. Costa Rica has amazing biodiversity, beautiful forests, and phenomenal national parks. Since that first trip, Douglas returned to enjoy birdwatching with friends and also to teach a tropical ecology course. Douglas has been to Turkey on three separate trips. On one occasion, he was invited to speak in a symposium on evolution held in Ankara, Turkey. This symposium was organized entirely by undergraduate students, and it brought together 1,100 people to listen to scientific experts discuss various topics in evolution. It was exciting for him to see how passionate the students and other audience members were to learn about evolution, even though it is still largely not accepted in their country. While doing field work for a project on beetles, Douglas and a PhD student were driving on a remote road in western Utah. They stopped to explore a lake bed to search for their beetles of interest, but they didn’t have any luck there. Further down the same road, Douglas declared that they had to pull over again because there was a dead badger in the road. After all, this was the first time he had ever seen a badger before. In examining the badger, they discovered many beetles, so they turned off the truck for an impromptu beetle collection session. When they got back in the truck, it wouldn’t start. They were stranded. With their insect samples in peril due to warm temperatures, and their own water supply unfortunately low, things weren’t looking good. No cars passed by, so they had to set up their tent and camp there for the night. The next day, Douglas and his student managed to get their truck on track thanks to a quarter and much-needed help from a handy passerby. Advice that was hard to act on, but the best advice Douglas ever received was to quit smoking. In addition, you should follow your curiosity, and do something you find inspiring and intriguing. Find a way to develop your passion into a successful and useful career. Also, remember that science is trustworthy. The same science that is used to create the technology that has improved our lives definitively supports that evolution is true. Though we still have a lot to learn in science, there is so much that we do know, and science is the best approach for understanding how our world works. Douglas is an evolutionary biologist whose research interests focus primarily on speciation and the evolution of ecological interactions among species. Most of his work has centered on the population biology of herbivorous insects and the evolution of their affiliation with host plants. Research on several species centered on genetic differences conferring adaptation to different host plants. These studies have cast light on the evolution of host specificity. Recent work has focussed on whether or not constraints on genetic variation are likely to have influenced the phylogenetic history of host associations in a group of leaf beetles (Ophraella beetles), and on the pattern of speciation in this group. Students in Douglas’s research group have worked on diverse evolutionary and ecological studies of insect-plant interactions and of speciation in insects. In addition to his research, Douglas has been the President of the Society for the Study of Evolution, the American Society of Naturalists, and the American Institute of Biological Sciences, as well as the editor of Evolution. He is currently editor of the Annual Review of Ecology, Evolution, and Systematics, and also the author of the successful textbooks Evolutionary Biology and Evolution.